I was having breakfast when I saw a not-so-ordinary bird landing in Douglas' water bowl. The bird has a white throat and belly and long tail that beautifully fans out. My mother said that it's not the ordinary "maya" or the Philippine Oriole (Oriolus steerii) we normally see around. The mysterious bird escaped fast. Though my mother was hoping it would come back. She even opened part of our love birds' cage and devised a food trap. When my father arrived, my mother related our encounter. My father said that what we saw was a "Maria Kapra." It is a wild bird that chases even dogs? I didn't believe my father. How can a wild bird roam around the city? He might have associated our description to another breed. I googled what my father said and guess who was wrong? Me! True enough, there is a bird named "Maria Kapra" in the Philippines. 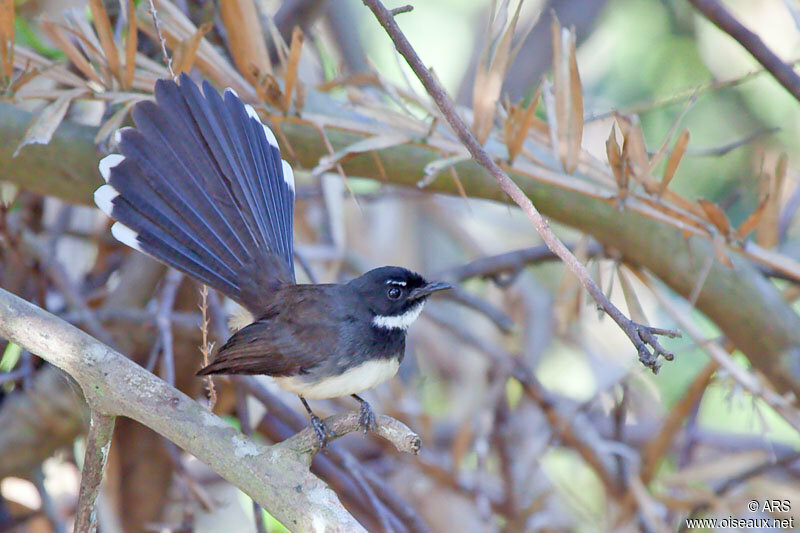 Maria Kapra is the Filipino term for Pied Fantail whose scientific name is Rhipidura Javanica. According to Manila Old Timer, the bird is very common in Philippines in plantations, parks and gardens. It is often found hopping from branch to branch fanning its tail. The bird is almost perfectly beautiful except for its behavior of attacking other birds and even dogs when nesting. Good thing we were not able to catch it. We used to see "maria kapra" in our backyard trees in sta cruz, laguna when i was just a kid, it moves so swiftly and i didn't appreciate it coz it was just an ordinary bird then. Yes that's a Pied Fantail. It is quite playful and chases cats and dogs.